Following up from my earlier post the city is now covered in election posters. 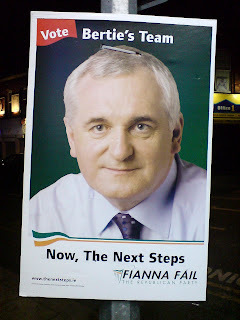 I see Fianna Fails generic poster is once again a picture of Bertie but with the slogan "Now, The Next Steps". I have to say it's no "A lot done, more to Do" of the last election.